Wash the rice and set aside. Soak the dried mushrooms in hot water until soft. Rinse and slice. Rinse the dried scallop, then soak in a little hot water. Rinse the dried shrimp and soak in water. Heat 2 tbs of oil and fry the yam until lightly browned. Set aside. Heat 1 tbs of oil and ½ tbs of sesame oil and fry the sliced pork belly till brown. Set aside. *Pour reserve oil into prewashed rice. Heat 2 tbs of oil and ½ tbs of sesame oil, fry the garlic and shallots until golden brown, then add the scallop, dried shrimp and mushrooms. Add in the washed rice, fried yam and pork. Add in 1 tsp of salt and 1 ½ tsp of sugar. Add in 1 tsp of light soya sauce, 2 tsp of dark soya sauce, ½ tsp of concentrated chicken broth. Remove the mixture from the wok and transfer into the rice cooker. Add 6 cups of water + 1 cup of mushroom reserve water and 20ml of scallop reserve water. Use the rice cooker to cook the rice until done. Serve with chopped coriander and dried shallots (optional). All my adaptations of the recipe have been indicated with an asterix * next to the ingredients list. 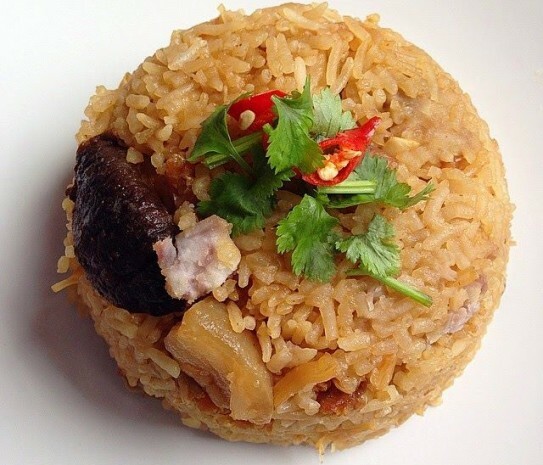 We love our rice with a chockful of ingredients :) Dad loves sesame oil so he suggested the addition of sesame oil. I didn't want to just add it into the rice. So I've incorporated it into the frying of the ingredients. Just a little sesame oil does bring up the fragrance of the rice!